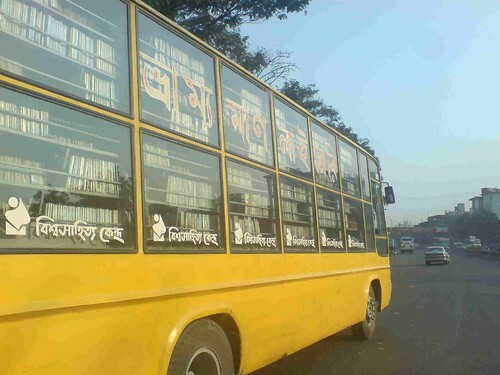 The other day while going home from work (in Dhaka) I noticed this yellow bus filled with books. When my car got closer, I realized it was almost like a library, with rows of books stacked on metal shelves. I got a colleague who could speak Bangla, to translate what it said on the bus and turns out its from the World Literature Centre. It said, “Bishwo (World) Shahitto (Literature) Kendro (Centre), London“. Basically its a non-profit centre that works towards empowering the community and it seems that this library bus is one of their projects. Their website is here. Wow … nice way to get books read!! !… only thing, you have to be sure that the library remains there, when you return the books. Great! I am proud that I am bangladeshi and we have such a wonderful attempt in our country. Thanks to Mr. Abdullah abu said(sorry for spelling if it is wrong). He is one of the guys who are positive about our country\s future and obviously appreciated for such a great effort to make better future of our country.